Ultranetbook? 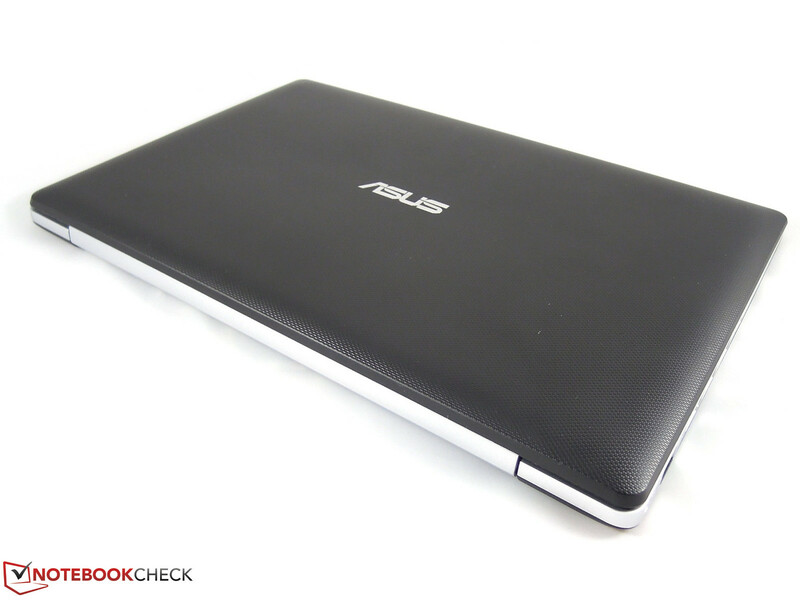 Thin like an Ultrabook, yet as affordable as a netbook - that must have been Asus' goal when developing this 11.6-inch subnotebook. We will need to see if the low price point of 350 Euro (~$470) allows Asus to pack enough performance into the 21.7 millimeter (0.85 inches) thick chassis. 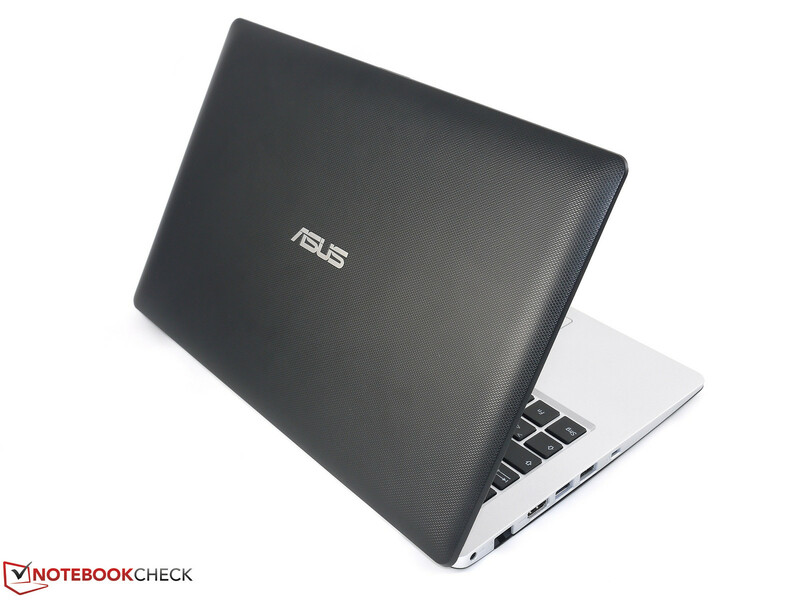 Manufacturer Asus is well know for their Ultrabook series, called "Zenbook". Not everyone wants to spend more than 500 Euro (~$670) on a thin notebook though - and that's where the X201E comes into play: a cross between a netbook and an Ultrabook, retailing at 270 Euro (~$360) with Linux. 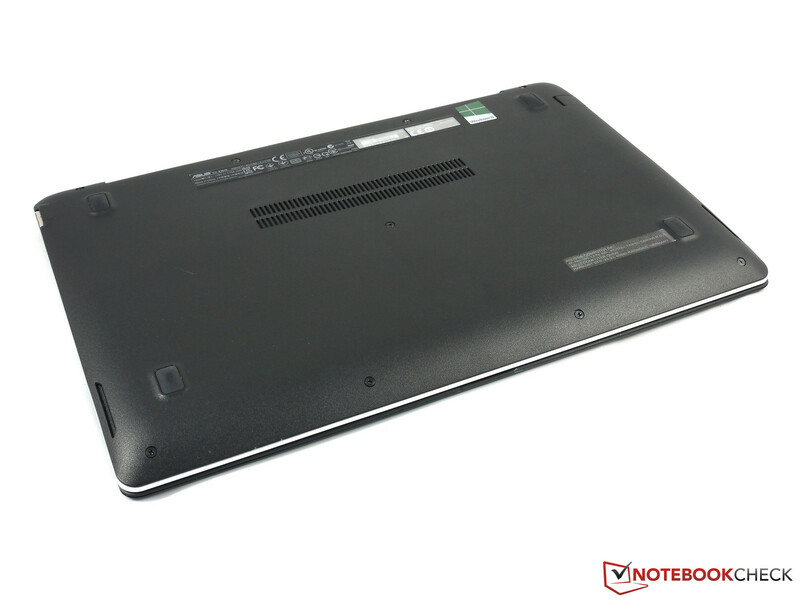 Competing models are netbooks like the HP Pavilion dm1 and affordable subnotebooks like the Lenovo ThinkPad Edge E130. 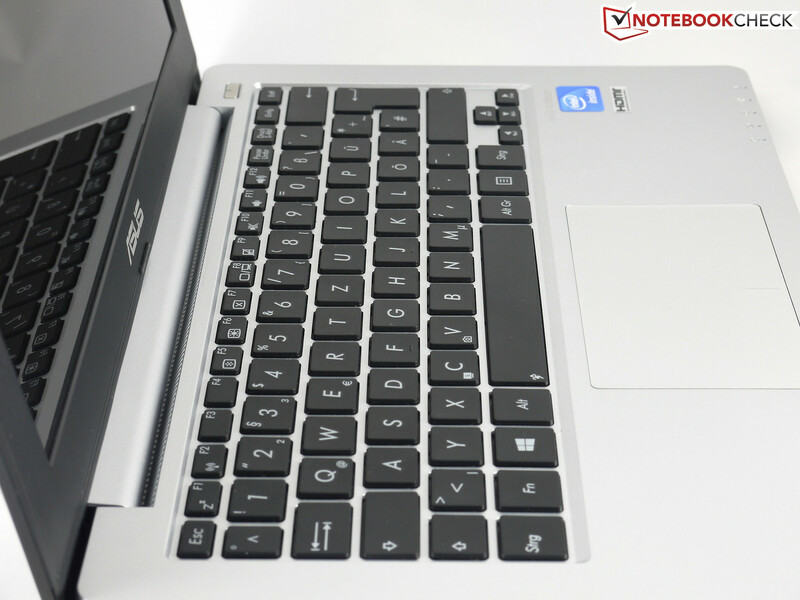 Can the Celeron-equipped X201 outperform the competition with netbook processors - or is it simply a slim netbook? ...and a textured display lid. 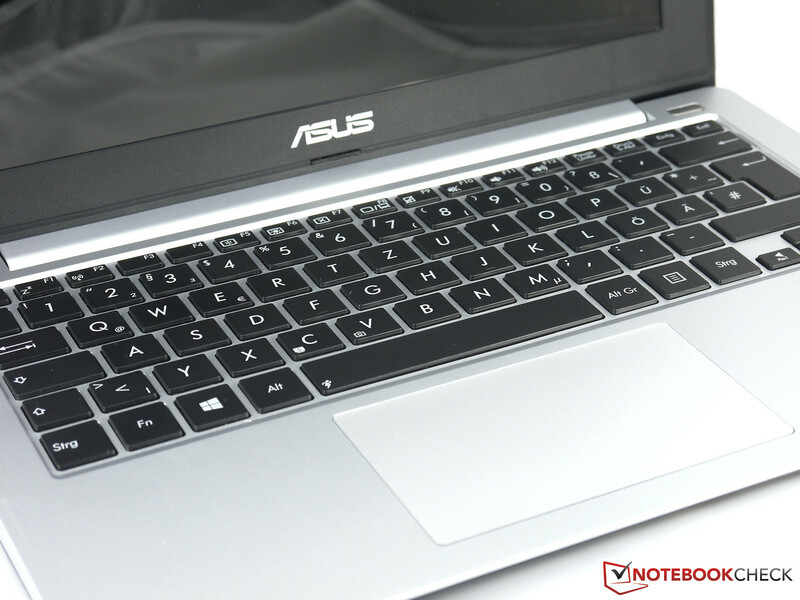 The Asus X201E is the stripped-down version of the Vivobook S200E. Visually, the two notebooks don't appear to be significantly different - the shape and measurements are identical. The chassis of the X201E is made from plastic while that of the S200E uses brushed aluminum. The cheaper materials don't impact the build quality, which is still on a very high level. An additional benefit of the plastic parts is the reduced weight of 1.31 kilogram (2.89 pounds). The back of the display is also slightly different. 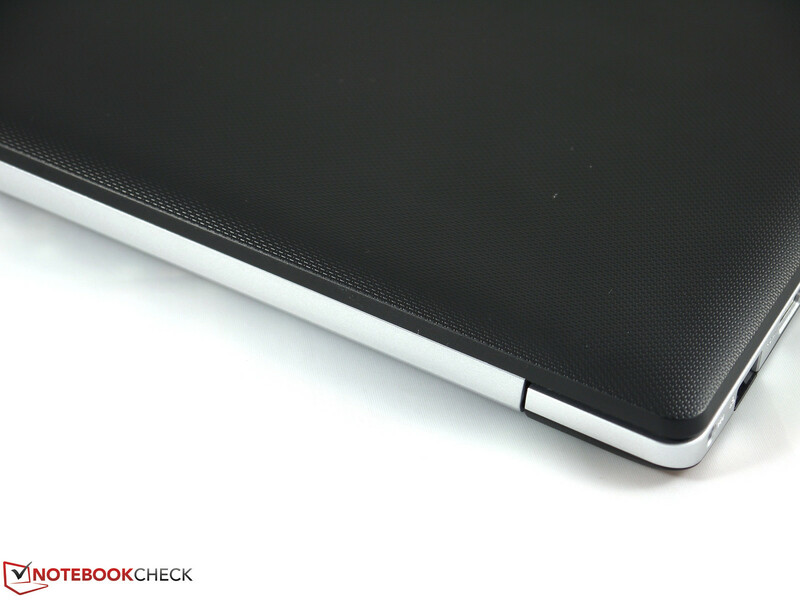 While the lid of the VivoBook has a smooth surface, the lid of the X201E is matte and textured, which makes scratches much less noticeable. We can't complain about the structural integrity either. 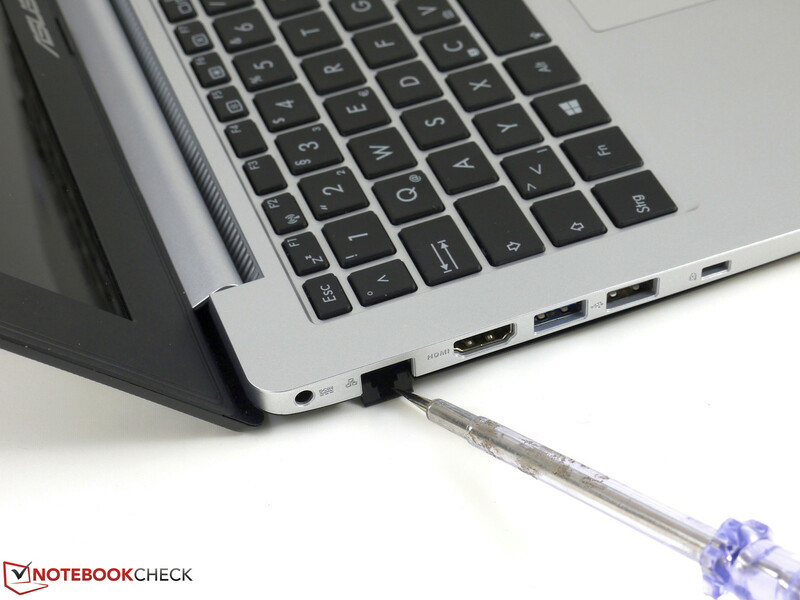 Even though the chassis is only 21.7 millimeter (0.85 inches) thick, the subnotebook doesn't lack rigidity. 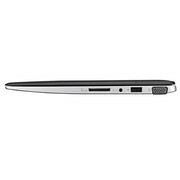 On the contrary, the X201E is torsionally more rigid than some Ultrabooks. The thin display lid also resists pressure and twisting reasonably well. The hinges are stiff and manage to secure the lid nicely, so the display should remain steady even when riding in a car. Since the hinges are rather stiff, both hands are required to open up the display. Although the X201E is a very compact unit, the port selection doesn't suffer as one might expect. 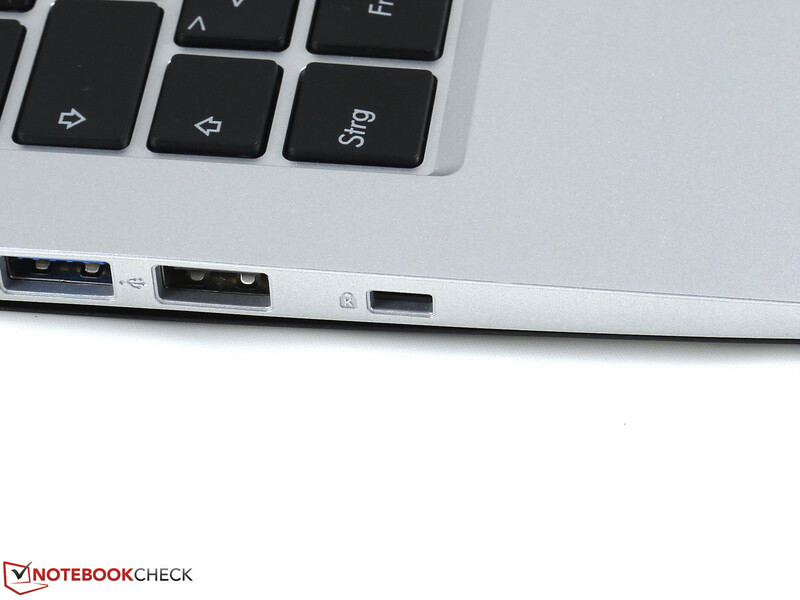 Most of the ports are located on the left side; those on the right are pushed towards the back which makes the notebook particularly suitable for right handers who use an external mouse. Some aspects could use improvement however. We don't like the fact that the video ports are not located on the same side, as a dual-monitor setup causes a mess of cables on the desk. It would have been better to locate both ports on the same side or in the back. As far as communication options go, Asus provides the essentials. The Atheros AR9485WB-EG Wireless Network Adapter allows for cable-free connectivity and supports 802.11 standards b/g/n. Signal strength (through 2 walls) was still maximum when we moved 10 meters (~33 feet) away from the router (Fritz!Box7141). At 20 meters (~66 feet) and through 4 walls, we saw only 2 of the maximum 5 bars. The WLAN adapter Intel Wi-Fi Link 1000 still showed 4 bars at this distance. Those without a Wireless LAN Router can also use regular Ethernet, although the Atheros AR8162/8166/8168 PCI-E Fast Ethernet adapter only supports connections speeds up to 100 Mbit/s. Bluetooth is lacking - at least our review model didn't have it. Since Asus mentions Bluetooth 4.0 in their product brief, we can only assume that future configurations are going to be equipped with it. Not much is included in the box aside from the notebook and its 33 watt power adapter. There is also a short user manual and a warranty card available. The bottom of the subnotebook allows access to the internal components. 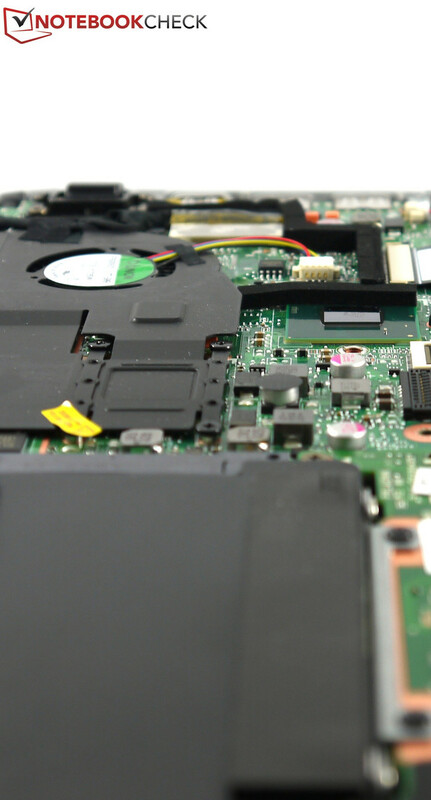 After removal of nine screws, the bottom plate can be carefully unclipped and the 2.5-inch hard drive, the WLAN card, and the fan (which allows for easy cleaning) become accessible. Otherwise, expandability is restricted. The RAM is soldered onto the motherboard. The battery can be accessed via a maintenance hatch, but is secured with additional screws. In Germany and Austria, the notebook comes with 1 year pick-up and return service, so the user is not responsible for shipping costs. 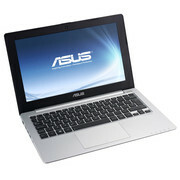 The warranty can be extended to 2 years for about 50 Euro (~$65) or 3 years for 89 Euro (~$120) via Asus' online shop. 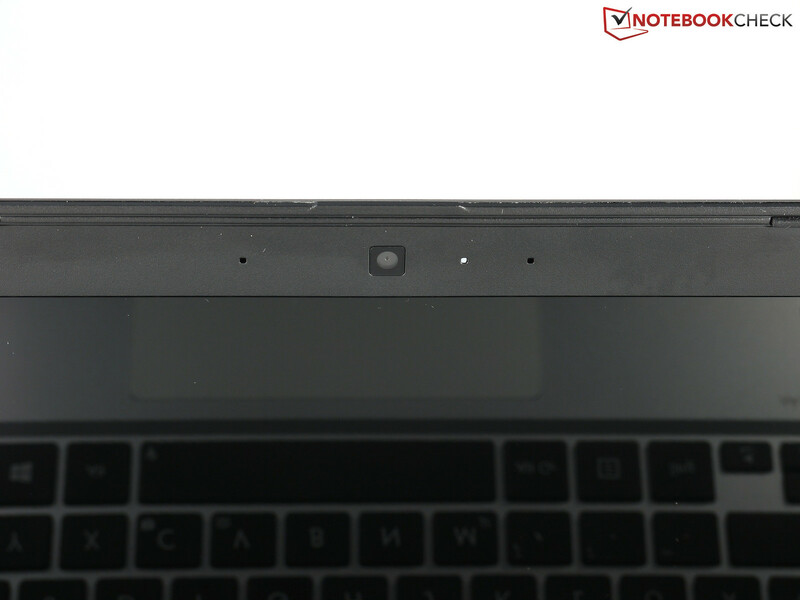 The keys of the 11.6-inch subnotebook are quite large at 15 x 13.3 millimeter (0.59 x 0.52 inches). Typing comfort is good as the fingers and hands are not all cramped together. The key travel is fairly low and the click point is clear and well defined. The sound level is unobtrusive and the the keyboard doesn't flex even under firm pressure. The touchpad measures 105 x 60 millimeter (4.13 x 2.36 inches) and features a smooth surface, which allows the fingers to glide easily and results in high cursor precision. In order to maximize the surface area, Asus doesn't use separate mouse buttons, but rather integrates them into the touch surface itself. 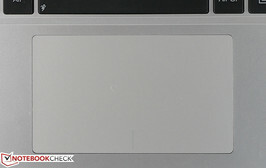 The touchpad also supports multitouch gestures, which work without any issues. As far as flaws are concerned, the upper edge of the touchpad was slightly raised in our review sample and the the pad isn't very sensitive towards the perimeter. 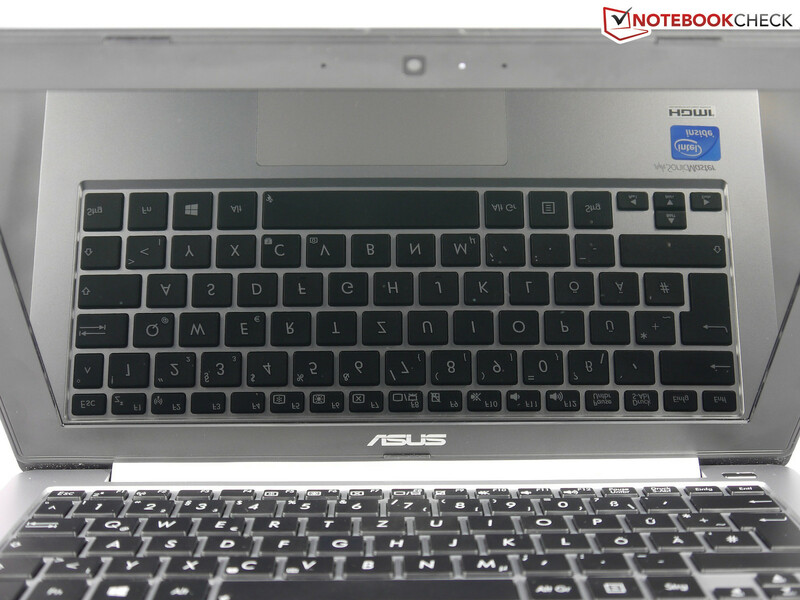 Asus uses the glare-type panel B116XW03 from AU Optronics, which we are already familiar with as the review model of the VivoBook S200E was equipped with the same screen. The only difference is that the display of the X201E is not touch sensitive which is an advantage here, since the touchscreen adds an additional layer and in case of the S200E, decreased both brightness and contrast. The LED backlit 11.6-inch panel features a resolution of 1366 x 768 pixels (135 PPI) and uses the cost efficient TN technology. We used the X-Rite i1Pro 2 to determine the maximum brightness of 228 cd/m² in the middle of the display. Brightness distribution is very good at 88 percent and we couldn't discern any differences in brightness at all. The average brightness is 210 cd/m² which is about average for this class of notebooks. The contrast ratio of 456:1 is very good however and leads to a saturated black and vivid colors. 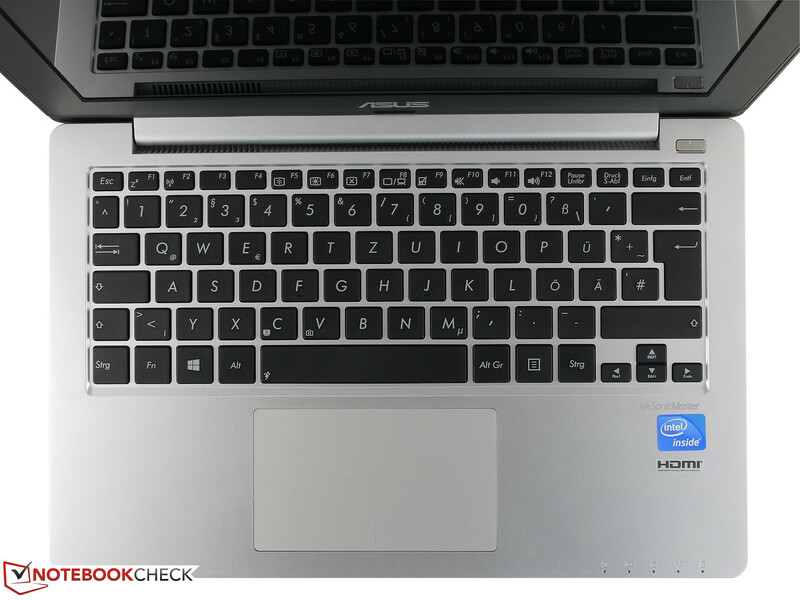 One of the competitors - the Acer Aspire One 756 - has a contrast ratio of 208:1, which results in more of a grey than black. The PCMark 7 benchmark test measures overall performance of all components (processor, RAM, and hard drive) using predefined usage scenarios, like photo editing and web surfing. Our review model scored 1359 points - ahead of systems equipped with AMD's E2-1800 APU and Intel's Atom N2600 CPU (+51 percent). 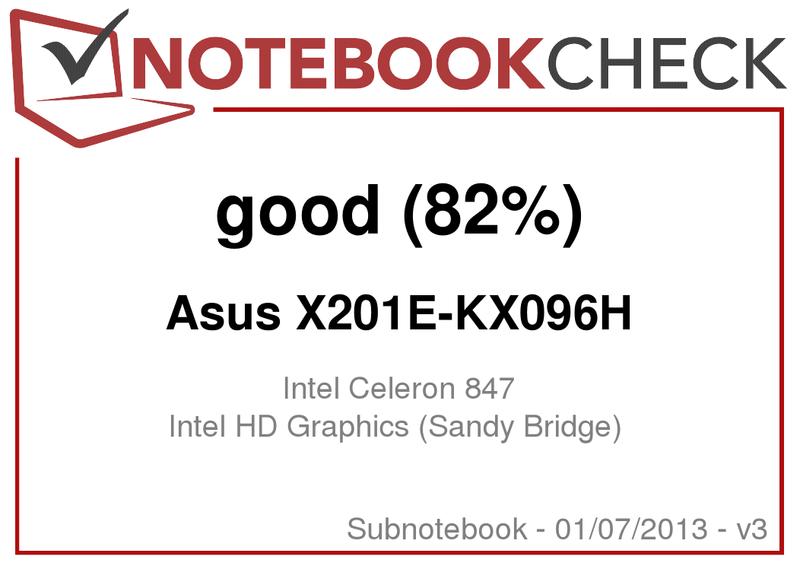 The Asus VivoBook S200E with the i3-3217U CPU reached 2081 points in the same test and is about 53 percent faster than the X201E. The system equipped with the Pentium 977 is about 13 percent faster, which is a much smaller difference. In addition to the CPU, the 2.5-inch, 320 GB hard drive is an additional performance bottleneck. Due to the low rotational speed of 5400 RPM, the hard drive is very quiet during writes, but data throughput is also impacted. When copying data between the two partitions, working or surfing at the same time results in long delays. But even when the system is in idle mode, opening programs sometimes takes a while. The hard drive benchmarks HDTune and CrystalDiskMark confirm our impressions. Using HDTune, we determined an access time of 19.9 ms and an average transfer rate of 49.4 MB/s. 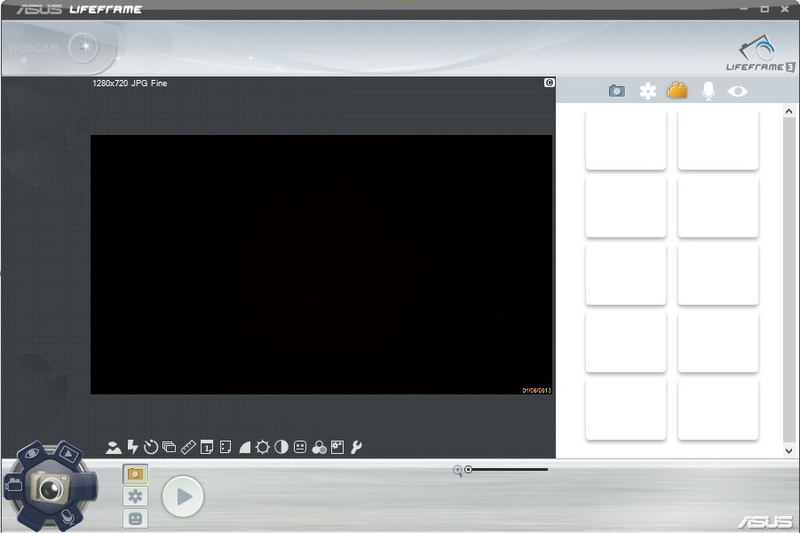 Graphics tasks are handled by the integrated Intel HD Graphics 2000. The GPU does not have its own dedicated RAM, but borrows from the system RAM instead. The GPU clock speed remains mostly at 350 MHz and only occasionally reaches 800 MHz. 3DMark 06 is the most current benchmark test which the X201E is able to handle. All newer versions didn't start or crashed during the tests. The subnotebook only achieved 1027 points, which results in a place towards the bottom of our benchmark database. 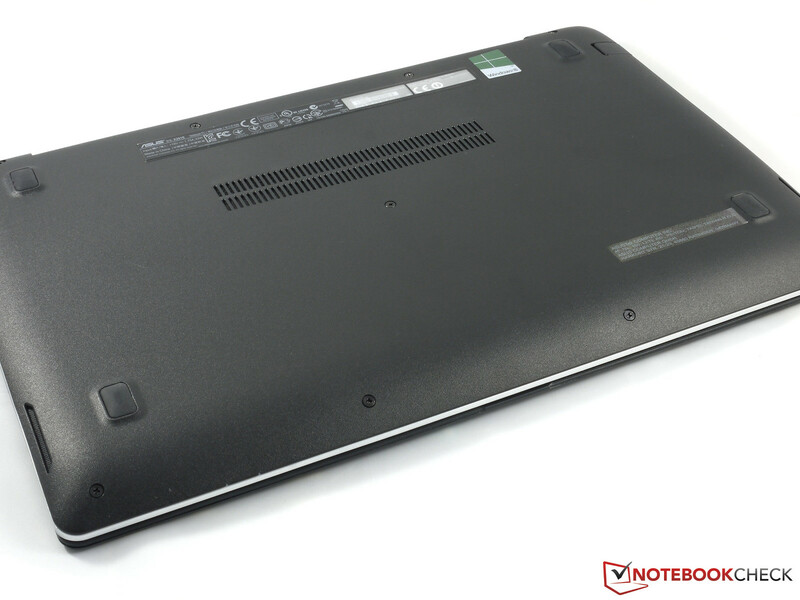 The X201E still places ahead of the Acer Aspire One D270 with the Atom processor, as it is about 73 percent faster. The HD graphics can't keep up with the integrated Radeon GPUs of the AMD E2 processors and trails by 41 percent (HD 7310) and 141 percent (HD 7340). 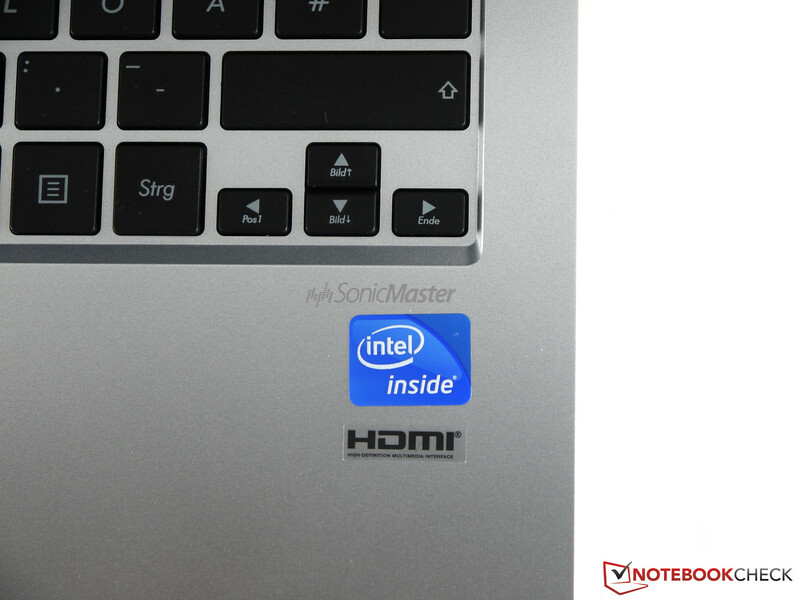 Since the VivoBook S200E (HD Graphics 4000) is subject to throttling, it only is about 56 percent faster than our review system. Even with the i3-3217U, the the X201E is not a system usable for gaming. When we repeated the tests while the notebook was running on battery, we didn't see any changes in the 3D performance. Gaming is not the strong suit of the X201E. Even the (certainly not very demanding) Fifa 13 was not playable without lag - and that at low details and with a resolution of 1024 x 768 pixels. The culprit is again the GPU clock speed, which remains at 350 MHz. During idle, the subnotebook is very quiet measuring at a maximum of 31.1 dB(A). When subjected to our stress test (Prime95 + FurMark), we measured up to 36.6 dB(A) from 15 centimeters (5.9 inches) away. Although this is definitely audible, the fan doesn't emit any annoying high-frequency noise - only a whooshing sound can be heard. 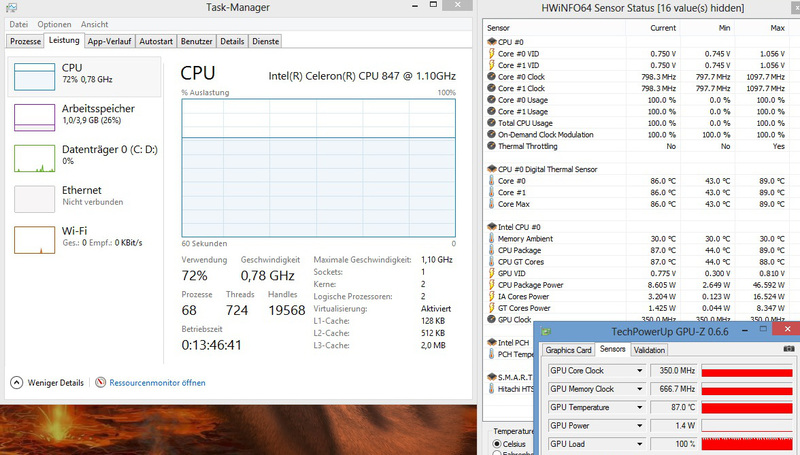 When the system is not pushed to the limit - like while running 3DMark 06 - the fan spins down to about 35.3 dB(A). Even during idle, the X201E gets slightly warm - we recorded 35 degrees Celsius (95 degrees Fahrenheit) at the bottom. During the stress test, we saw temperatures increase to 46 degrees Celsius (114.8 degrees Fahrenheit) on the underside and 39 degrees Celsius (102.2 degrees Fahrenheit) around the palm rest area, which is noticeably warm. Due to the heat, we don't recommend using the notebook on the lap when the utilization is at its maximum, as it can get uncomfortable. 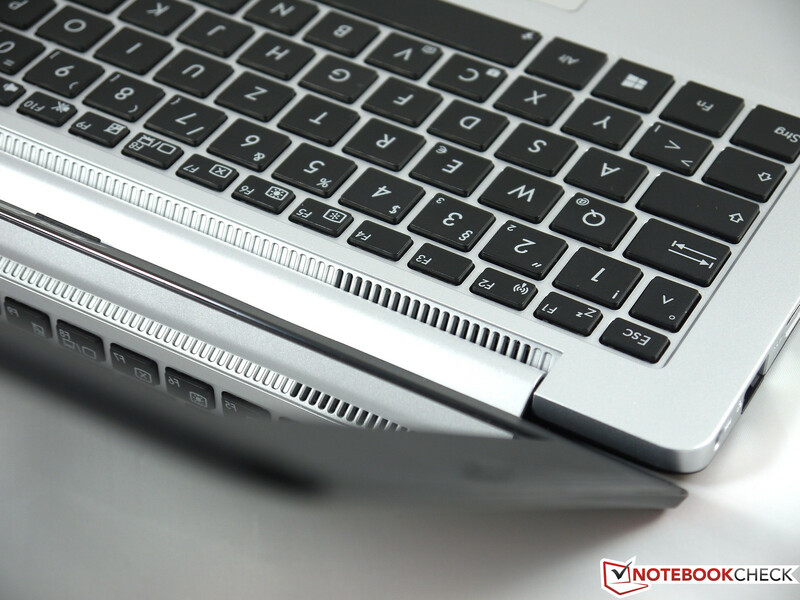 During daily use (web browsing or writing documents as an example), temperatures are not critical and the notebook can be used on the lap without issues. After we ran our stress test for a few hours, the CPU reached a maximum temperature of 86 degrees Celsius (186.8 degrees Fahrenheit). Although we didn't notice any further throttling due to temperature issues, performance is decreased under maximum load since the clock speed is reduced to 800 MHz to begin with. (+) In idle usage, the average temperature for the upper side is 29.5 °C / 85 F, compared to the device average of 30.7 °C / 87 F.
(-) The average temperature of the palmrest area of similar devices was 28.6 °C / 83.5 F (-10.1 °C / -18.2 F). The X201E has two speakers located on the front of the unit. The maximum volume is certainly sufficient for a room of 20 square meters (~24 square yards) and the sound also remains free of distortion. Acoustically, the sound is fairly well balanced, although bass is lacking. For the size of the notebook, the speakers are actually quite decent and on par with those found in some 15.6-inch systems. If more bass is desired, we recommend hooking it up to an external sound system using the HDMI port or the headphone jack. Power consumption during idle is slightly above the competition (7.7 - 10.3 watts, Acer Aspire One 756). We used FurMark and Prime95 to determine the maximum power consumption of 21.7 watts. 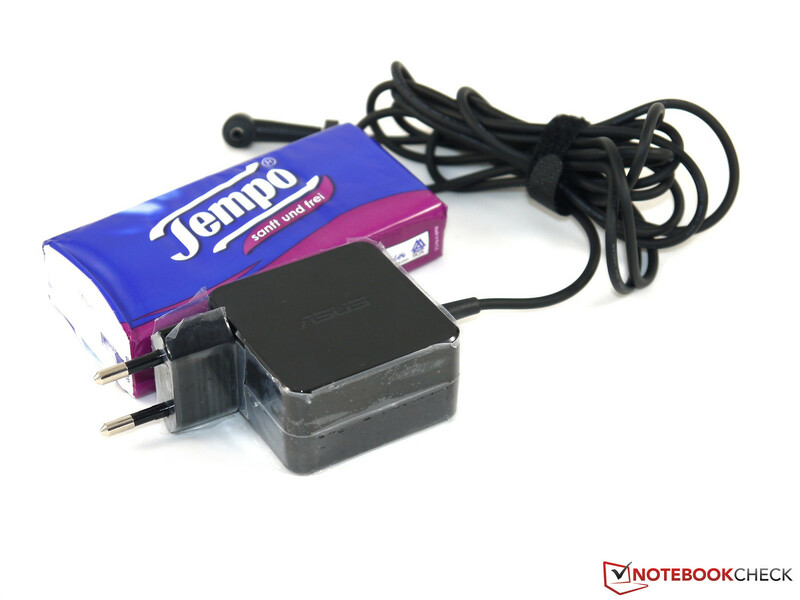 The power adapter (33 watts) should be able to handle the load without issues. While playing a game or when subjecting the system to a benchmark (in our case 3DMark 06), the power consumption decreases to a very good 20.2 watts. Since throttling does occur, this low value is not really surprising. To determine the maximum battery life, we use the tool BatteryEater and run the Reader's Test, which scrolls through a simple text document. 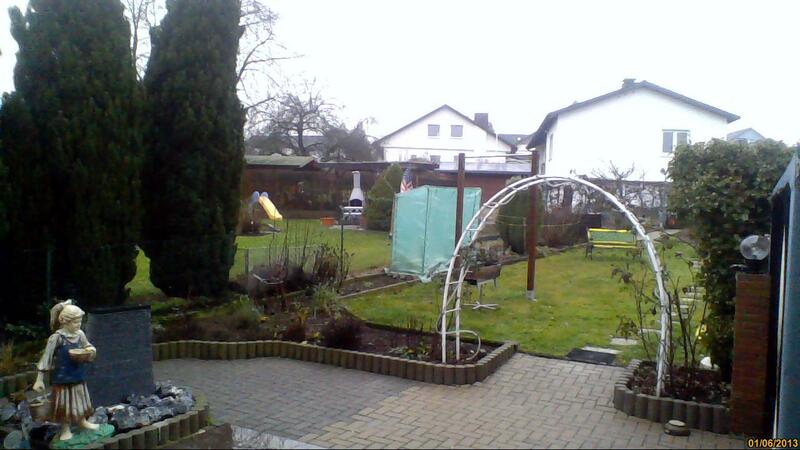 The screen brightness is at its lowest level and the WLAN modules are deactivated. It took 5 hours and 12 minutes for the notebook to shut down - a paltry result compared to the ThinkPad Edge E130/E135, which could post one hour more when running the WLAN test. 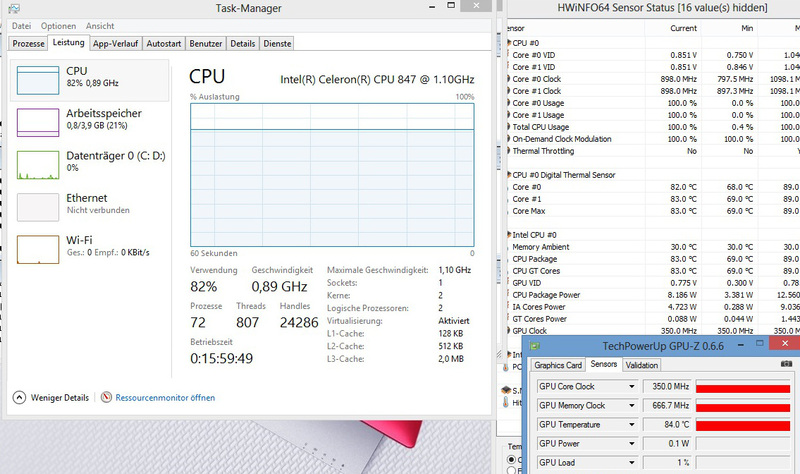 Running the WLAN test, the X201E only lasted 3 hours and 11 minutes - far behind the HP Pavilion dm1 (~ 6 hours). 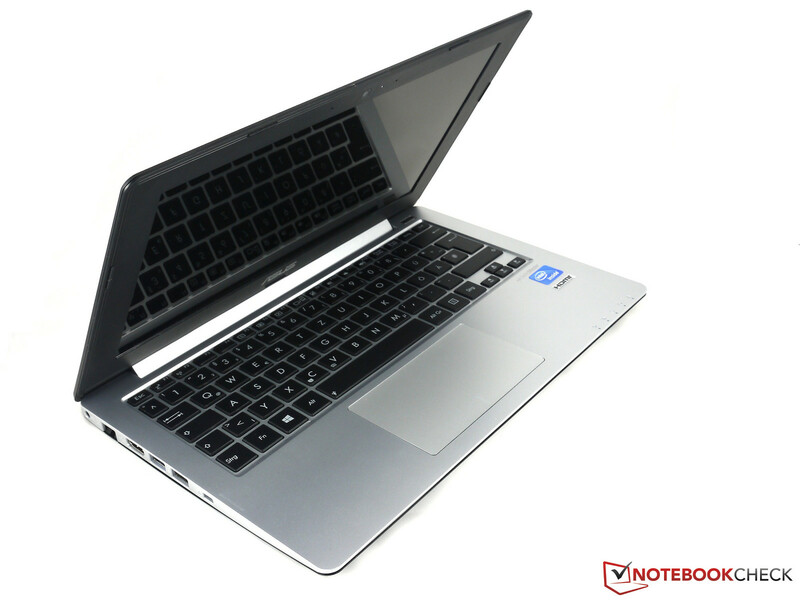 The minimum battery life is 109 minutes - again a value which most other notebooks can easily surpass. When the 38 Wh battery is empty, it takes 4 hours and 7 minutes to reach a full charge. We find this unacceptable, since the battery life is so short to begin with. Mobility is severely restricted due to these factors. 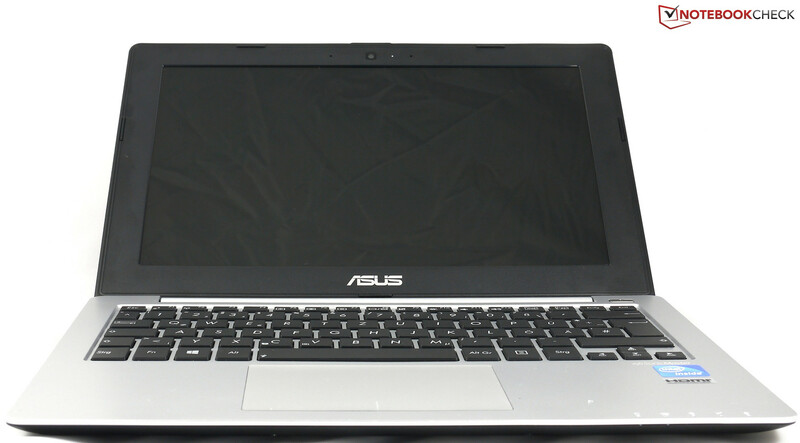 The X201E is a worthy successor to the (netbook predecessor) Eee PC series, although Asus neither calls it a netbook nor Eee PC. Performance is obviously still not a priority, but the chassis is very portable due to the slim and compact design and very sturdy to boot. Our main points of criticism are the short battery life, the very long recharge time, and the glare-type display - all of which reduce the mobility factor. 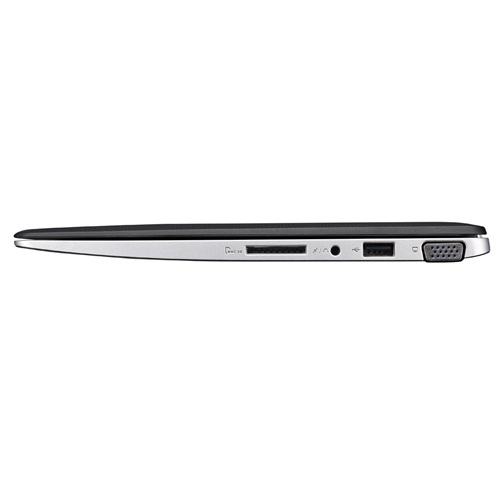 For 350 Euro (~$470), the X201E is a notebook with a very quiet and comfortable keyboard and suitable for students - as long as working in the sun is not required and an outlet is close by. The HP Pavilion dm1 scores better in some areas: battery life is significantly longer and charging the battery only takes 2 hours. On the other hand, the chassis is not as sturdy, and the display is clearly lower quality. 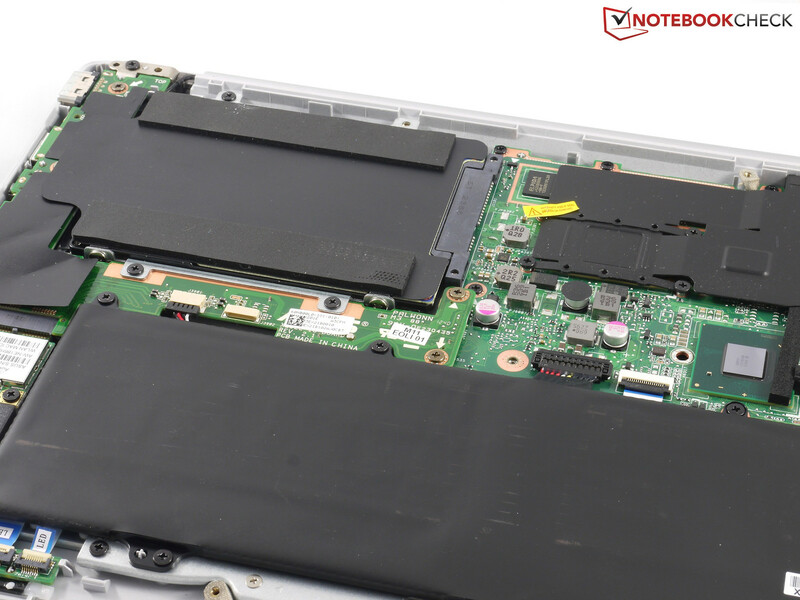 The Acer Aspire One 756 doesn't offer a lot more performance, but suffers from the same issues as the dm1 (specifically an inferior chassis). 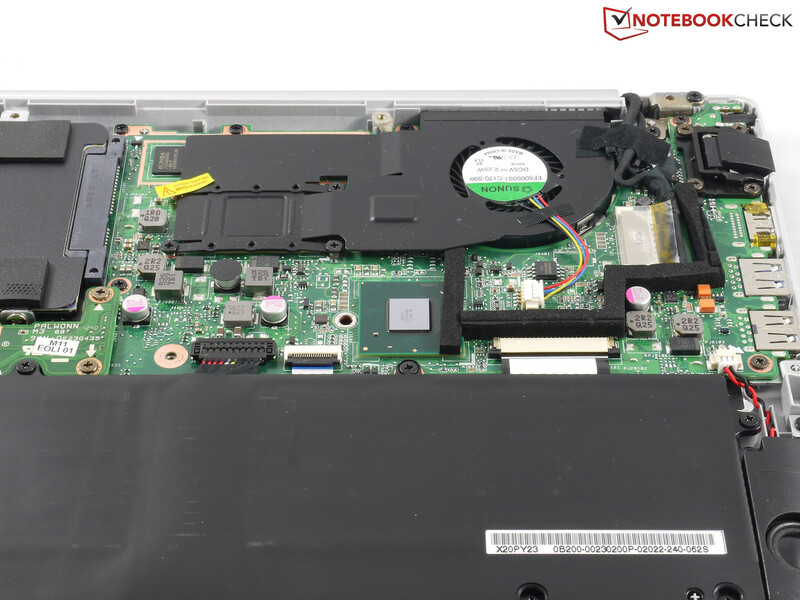 If the reflective display is a problem, the Lenovo ThinkPad Edge E130/E135 is worth a consideration, as it is built well, sturdy, and features long a battery life and very good input devices. The E130 is available with the i3-2367M and Pentium 977 offers a lot more performance; the E135 (with the AMD processors) falls behind the X201E and is no contest in the CPU stakes at least. The fan exhaust is hidden behind the hinge. The Kensington Lock slot is located towards the front on the side. Since the chassis is so thin, the LAN port features a fold-out design. 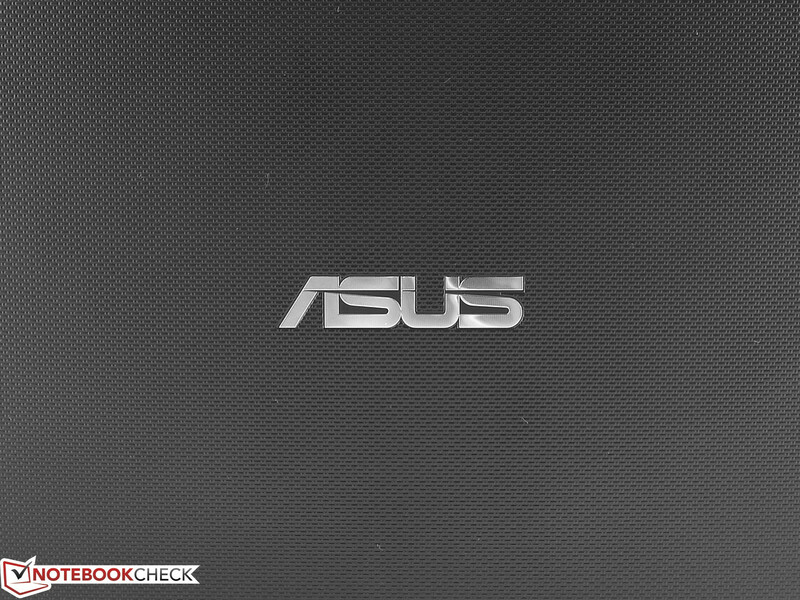 ...Asus did some photo editing here and erased the bottom cover. ...to gain access to some of the components. ...in order to clean it. ...and the WLAN module can also be swapped out. ... is enough to use the notebook on the lap. The laptop is sturdy and well put-together. We appreciated the quality of the input devices. The keys are surprisingly large. A negative: the reflective display. ...and offers good quality imagery. The power adapter is rated 33 Watts. The outstanding build quality and the affordable price. A matte display and better battery life. That Asus chose not to call the X201E "Eee PC". With a matte display: Lenovo ThinkPad Edge E130/E135.